This is a sweet, new adult friends-to-lovers romance. It is the story of college BFFs Sam and Wesley and the two-week road trip they take to Sam’s sister’s wedding. One year after graduating from college, Sam and Wesley find themselves unemployed and somewhat directionless. But the road trip introduces an intimacy that neither Sam or Wesley is ready for. I liked both Sam and Wesley. Introverted Sam feels older and slightly more grounded than the more extroverted Wesley, but Sam lacks confidence and struggles socially. Wesley feels more like an ordinary 23-year-old. Wesley and Sam complement each other, and I love the shared history between them. I love the way Sam and Wesley’s relationship develops during the road trip as the two men start to relate to each other more as adults than college kids. There is a lovely buildup of tension between these two that leads to some very hot scenes. I think the plot is the weakness of the story. The first part of the road trip is too familiar and the tropes are quite tired. I’ve read at least a couple of stories with similar storylines in the past few months. The last third of the book takes a darker turn but -without any spoilers- the big issue that is introduced is perceived and dealt with in a very American way that felt more than a little over-the-top to me as a British reader. Sadly, the plot doesn’t feel very cohesive as it jolts from road trip to BIG ISSUE to epilogue. The first two words of the novel were Williamsport, Pennsylvania – shout out to my neck of the woods! The next thing that hooked me was the premise of taking the long way around to Montana from Pennsylvania. Bear in mind, I began reading this novel while on a cross-country drive back home to Pennsylvania from New Mexico. Three solid days of 13+ hours per day to get home, so that part of the premise resonated within me. Sam just lost his internship and his sister is getting married, so he has no excuses to miss the big event. Having turned runaway groom on his college sweetheart, Sam hasn't been back home to Montana since the scandalous event. Wesley and Sam have been besties since college, with Wesley being the shoulder to cry on after Sam's life-changing decision to leave his ex at the altar. Wesley is a free-spirit, knowing Sam is beyond reluctant to go home, suggesting they go on a road trip. Now, this is where I had a difficult time connecting with the novel, taking me five attempts to read a book by one of my favorite authors. The road trip's vibe was giddy, lighthearted, yet moody at the same time. I found a good bulk of the novel to be tedious, dragged down by a ton of inane scenes and details in a quest to add a slow-burn vibe, which had me losing interest. I'm a great lover of slow-burn, but there were too many pages to support such a light plot. I feel badly for saying such, but I stuck it out and soldiered forth, finding the last third to be more emotionally connecting. Favorite scene of the entire book – the mutual tug in the car. Never one who employs spoilers, this is information I wish I had had, so I'm adding it anyway. The Long Way Around contains alcoholism themes. This gave me a whiplash effect, after 3/4 of the novel being lighthearted, to be dropped into something so heavy. But more so, and this is on me, I found it triggering. As the survivor of a 20-year marriage to an alcoholic, Sam waiting at the hotel, terrified, thinking he would have to call the police or check the hospitals, since Wesley hadn't come back yet, I had to take a step away. I'd been in that situation innumerable times, and I couldn't handle reading it. I'd love to say this part was out of nowhere, or resolved too easily, but I'm just happy someone, even if it was in fiction, got to have the happy ending. This was the epitome of slow-burn romance, featuring two best friends who finally found their way to one another, after taking The Long Way Around. Recommended to MM contemporary romance readers and fans of the author. 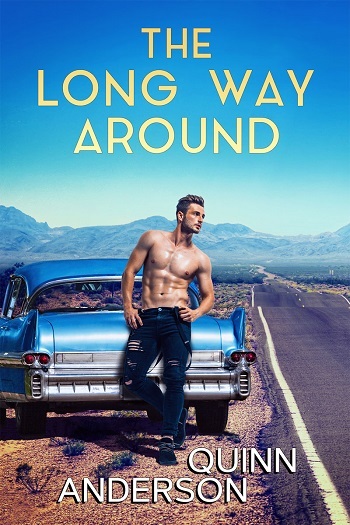 Reviewers on the Wicked Reads Review Team were provided a free copy of The Long Way Around by Quinn Anderson to read and review.